Tell-Em Public Relations won the prestigious award of PR Campaign of the Year during the Public Relations Society of Kenya (PRSK) awards ceremony for 2010. The agency’s campaign for the FIFA World Cup Trophy Tour by Coca-Cola in Kenya in November 2009 was awarded for its outstanding PR Campaign and media relations. Receiving the trophy are some Tell-Em staff members. 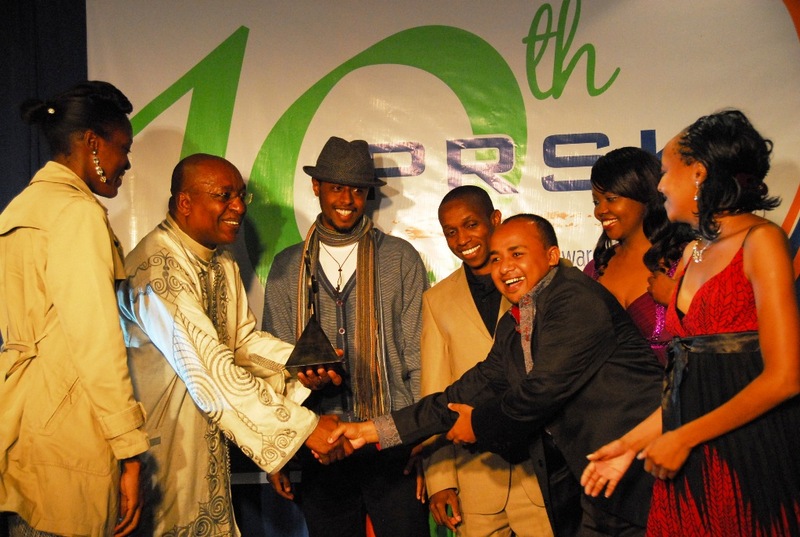 Tell-Em Public Relations won the prestigious award of PR Campaign of the Year in this year’s Public Relation’s Society of Kenya (PRSK) awards for 2010. The agency’s campaign for the FIFA World Cup Trophy Tour with Coca-Cola in Kenya in November 2009 was awarded for its outstanding media relations coverage. The campaign achieved over 428 media mentions and it advertising value was over Ksh 19,864,661. Commenting on the win, the agency’s Managing Director, Elizabeth Cook said that the company won the award for its ability to be creative and strategic and also for its focus on digital media. “We knew that there would be media interest in the FIFA World Cup Trophy coming to Kenya, however we needed to show the relevancy of the cup to Kenya and we also needed to ensure that the story was not confined to just the sports pages. Creating a lot of buzz online in social media was also a focus”, said Cook. The Tell-Em Team generated two front page newspaper stories and it also generated stories in consumer, lifestyle, entertainment and business sections of the media as well as numerous mentions on Twitter and Facebook. Norah Odwesso, the Public Affairs & Communication Director for Coca-Cola East & Central Africa noted that the award-winning campaign was a result of building strategic partnerships with key partners. “The FIFA World Cup™ Trophy Tour by Coca-Cola is as a result of the dynamic partnership we have with the soccer governing body,” said Odwesso. “The success of the FIFA World Cup™ Trophy Tour by Coca-Cola is a testament to the solid partnerships we built within the organization, with media, the government, our consumers and the agencies that supported this activation,” she said. Tell-Em Public Relations has won numerous PRSK awards over the years, including Best PR Campaign in 2003 and runner up to Best PR Campaign in 2004, it has also won PR Best Consultancy and Runner Up Best Consultancy in 2005 – 2008, this is its seventh award. Tell-Em Public Relations is associated with the global agency – Fleishman Hillard, which is one of the largest PR agencies in the world. Clients of Tell-Em Public Relations include Visa, British Airways, MTV, IFC, along with Coca-Cola, the agency has offices in Nairobi, Kampala and a consultant in Dar es Salaam.